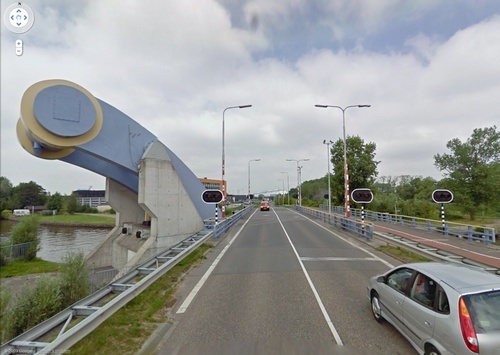 This giant kite shaped object, showing the yellow and blue flag of the city of Leeuwarden, the Netherlands, is not any sculpture, rather it is a portion of a road over Harlinger Vaart River which has been raised up like a draw bridge to allow passage of ships. 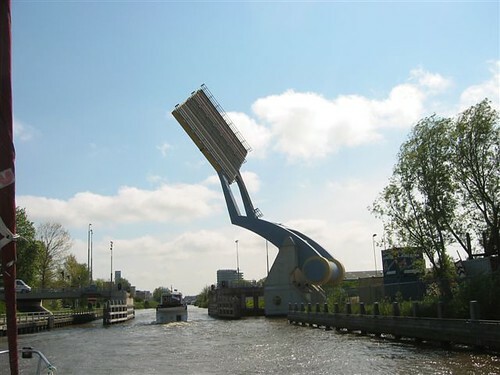 Known as Slauerhoffbrug (Slauerhoff Bridge), it is a tail bridge (kind of a bascule bridge) which can be quickly and efficiently raised by means of hydraulic mechanism to allow frequent passage of water traffic with minimum disruption to the vehicular traffic. 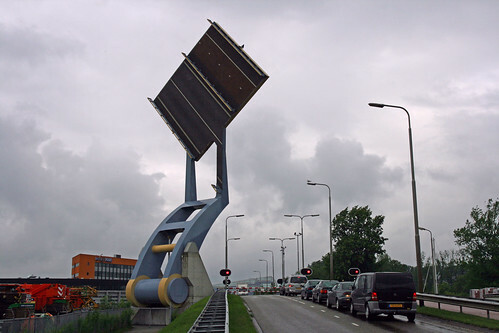 Built in 2000 the bridge is operated automatically almost every hour by two hydraulic cylinders which lift high in the air, a huge 15m by 15m portion of asphalt road. When closed the bridge deck merges seamlessly with the approach roads at both the ends. The rhombus shaped deck when raised fully can be seen from miles and it is not only an engineering accomplishment, but also looks like a work of art. 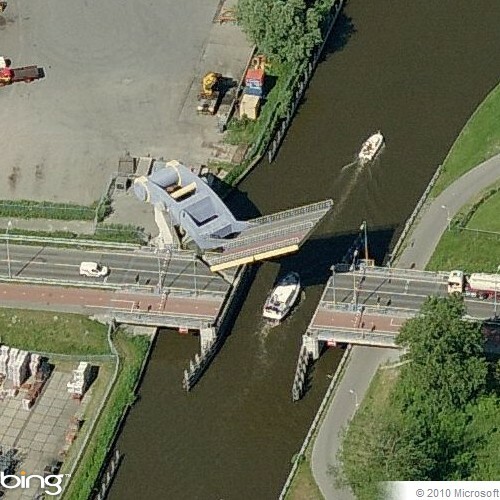 The locals call it the 'Flying Bridge' because of its kite like appearance. Ik heb het blog van u ook even gezien,voor mij een eer dat mijn foto er staat.